The early Eocene thermal maximum was followed by global cooling, with major temperature decreases in the early-middle Eocene (50-48 Ma), late Eocene (40-36 Ma), and early Oligocene (35-34 Ma) (Zachos et al. 2001). These climatic changes are temporally correlated with significant faunal extinction events at the end of the middle Eocene - the most severe of all prehuman Cenozoic mass extinctions - and in the earliest Oligocene (Prothero 1994). As detailed in the preceding section and at least concerning European mammals, the early Oligocene extinction events are only indirectly related to climatic changes, but can be traced back to faunal exchanges owing to the disappearance of major geographic barriers. Concerning the Eocene extinctions, Lindow and Dyke (2006, p. 483) assumed that climatic changes did play a major role and that "deteriorations in climate beginning in the middle Eocene appear to be responsible for the demise of previously widespread avian lineages like Lithornithiformes and Gastornithidae." The factual basis for such generalized conclusions is still, however, rather slim. 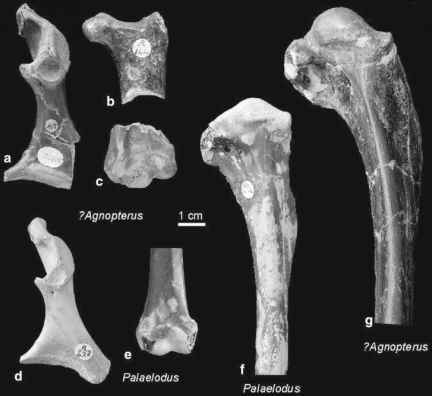 Unquestionably, there are many avian taxa which seem to have been widespread in the early and middle Eocene and have no unambiguous later fossil record. In addition to the Gastornithidae and Lithornithidae, these include the Presbyornithidae, Gallinuloididae, Prophaethontidae, Sandcoleidae, Halcyornithidae ("Pseudasturidae"), Messelasturidae, Primobucconidae, and Fluvioviridavidae. Other avian groups, such as the Leptosomidae, Nyctibiidae, and Steatornithidae, at least disappear from the Northern Hemisphere after the middle or late Eocene. At present, however, our knowledge of the exact stratigraphic occurrence of these taxa is simply too poor to correlate their extinctions with other biotic and abiotic events. In the Northern Hemisphere, climatic cooling had a profound impact on the vegetation of North America, where paratropical rainforests were replaced by open and more arid woodlands toward the late Eocene and Oligocene. These environmental changes affected the diversity and composition of mammalian faunas and led to a decimation of arboreal species toward the Oligocene (Webb 1977; Janis 1993; Cox 2000). Likewise, they are probably responsible for the disappearance of many lineages of early Paleogene forest-dwelling birds from North America. The Zygodactylidae, for example, have no fossil record in North America after the early Eocene, but were still quite common in Europe in the early Neogene. Coliiform birds occurred in the early Eocene of Europe and North America, and during this period very similar species lived on both continents. Their latest record in North America is the late Eocene Palaeospiza bella (Sect. 16.2.2), whereas coliiform birds persisted into the Neogene in Europe (Ballmann 1969b). The same is true for stem group representatives of the Coraciidae/Brachypteraciidae, which are only known from the early Eocene of North America, but evolved into present day rollers in the Old World. The Protostrigidae may also have survived longer in Europe, where they were found in early Oligocene deposits, whereas all North American records are of Eocene age. Prothero 1994). As yet, no convincing evidence has been presented that climatic cooling had a major impact on the demise of avian higher-level taxa in the Eocene of Europe (contra Lindow and Dyke 2006). Climatic cooling certainly explains today's absence of frugivorous and insectivorous birds with poor dispersal capabilities in natural higher-latitude habitats of the Northern Hemisphere, such as the Trogonidae, Coliidae, and Psittacidae. However, the Oligocene climate was still rather equable, and in Europe the taxa just mentioned persisted into the Neogene (Olson 1985; Feduccia 1999). Their extinction was probably not before further climatic cooling toward the Pliocene had led to the cold Northern Hemisphere winters with little food supply for nonmigrating insectivorous or frugivorous birds. Concerning mammalian evolution, Alroy et al. (2000: 259) concluded that "over the scale of the whole Cenozoic, intrinsic, biotic factors like logistic diversity dynamics and within-lineage evolutionary trends seem to be far more important" than climatic changes. The same is also likely to be true in the case of birds, in particular those of the Eocene epoch.